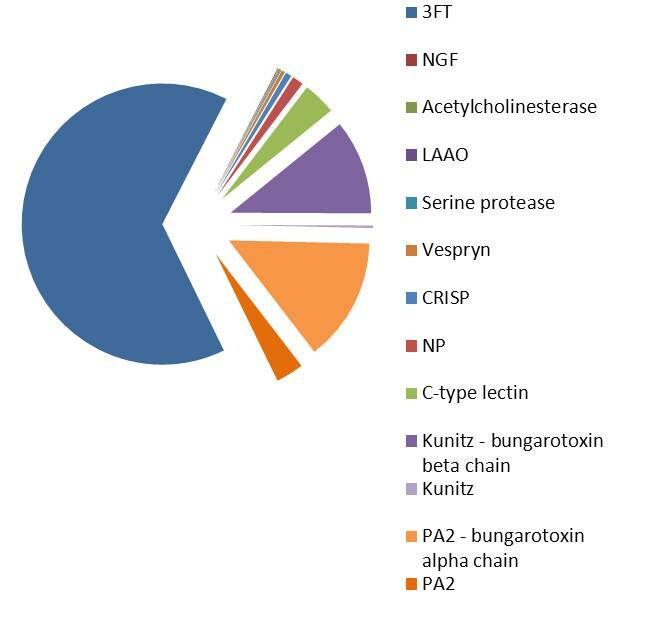 Figure 1: Composition of B. multicinctus venom, studied at the transcriptomic level. The venom contains the following families: 3FTx (snake three-finger toxin ), NGF (NGF-beta ), acetylcholinesterase, LAAO (flavin monoamine oxidase (L-amino-acid oxidase) ), serine protease (peptidase S1, referred to as a prothrombin activator (Pa) in the study), ohanin/vespryn, CRISP, NP (natriuretic peptide ), C-type lectin (true venom lectin ), Kunitz (Venom Kunitz-type, PA2 (phospholipase A2 ) (Jiang et al., 2011 ). Venom metalloproteinases were not observed in this study (Jiang et al., 2011 ), whereas Guo et al., 2007 reported the presence of a metalloproteinase in this venom. and the WHO snake database to access snake distribution and antivenom products. Lethal dose LD(50) is 0.108 mg/kg when subcutaneously injected (Jiang et al., 2011 ).